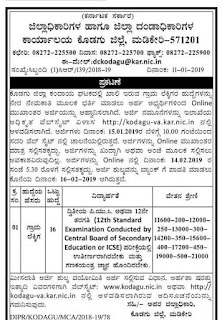 Kodagu District Village Accountant Jobs Recruitment 2019: Kodagu District Revenue Department has released notification to recruit eligible candidates for the post of Village Accountant. Total available vacancies in Kodagu District Recruitment are 16 posts. Application forms for Village Accountant Jobs available from 16-01-2019. 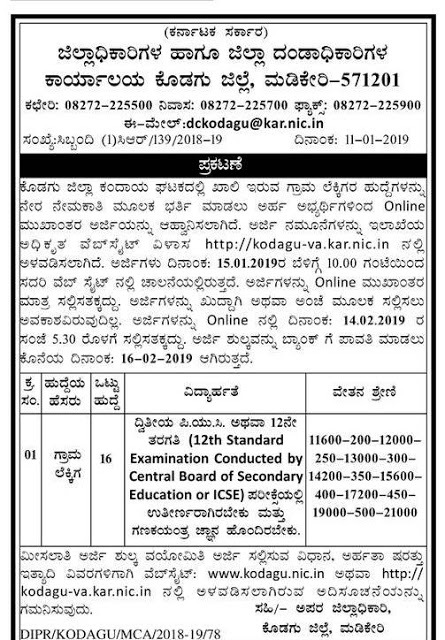 Interested candidates with all eligible criteria need to go through the district website http://Belgaum-va.kar.nic.in and submit the application through online before 14-02-2019. Candidates should have passed CBSE or ICSE 12th class from any recognized state board. Application fee for Cat- 1/ SC/ ST candidates is Rs. 100/-, for Cat 2A, 2B, 3A, 3B and for general candidates is Rs. 200/-. Monthly Pay Scale for Belgaum District VA jobs is Rs. 11600/- to Rs. 21,000/-. Selection for this Village Accountant Jobs in Belgaum district Recruitment is based on candidate academic qualifications & merit in written test. Full details regarding application procedure, application fee, Selection process, Age limits, Pay Scale details for Belgaum District Revenue Department Village Accountant Jobs Recruitment are stated below. Total NA vacancies available in Kodagu District Recruitment are 16 posts. Name of the Department: Revenue Department. Total No of vacancies: 16 posts. Candidates must have qualified CBSE or ICSE 12th class/ PUC Examination from any recognized state board. See the notification for more information. Age limit for general applicants is 18 years to 35 years. Age limit for the candidates of Cat- 2a, 2b, 3b, 3b is 18 years to 41 years. For Cat- 1, SC, ST candidates is 18 years to 40 years. Pay Scale for Kodagu district VA jobs is Rs. 11600/- to Rs. 21,000/- per month. Selection of candidates for Kodagu Village Accountant vacancies is based on their merit in academic qualifications or written test. Check the notification for more selection process details. For Cat 2A, 2B, 3A, 3B and for general candidates application fee is Rs. 200/-. Interested/ Eligible candidates applying for District VA Jobs may go through the official website http://Kodagu-va.kar.nic.in. Submit the application form with required documents before 14-02-2019.